Our month in Belize was a real treat. We got to spend time with family, party it up on a couple laid back Caribbean islands, explore some amazing national parks, and even spend a week camping on a beautiful secluded island. Even with all these amazing adventures, after a month we found ourselves longing to get back to Mexico. It’s hard to say what it is about Mexico; maybe it’s because the people are so nice and welcoming, maybe it’s because the land is so diverse and awe-inspiring, maybe it’s because the food is so fantastic, or maybe it’s because it’s so cheap (especially compared to Belize). Whatever it is, as we crossed the border back into the Yucatan peninsula, there was a feeling of comfort, almost as if we were heading back home. Our first destination back in Mexico was Bacalar, a magical little town with a warm traveler’s vibe to it. 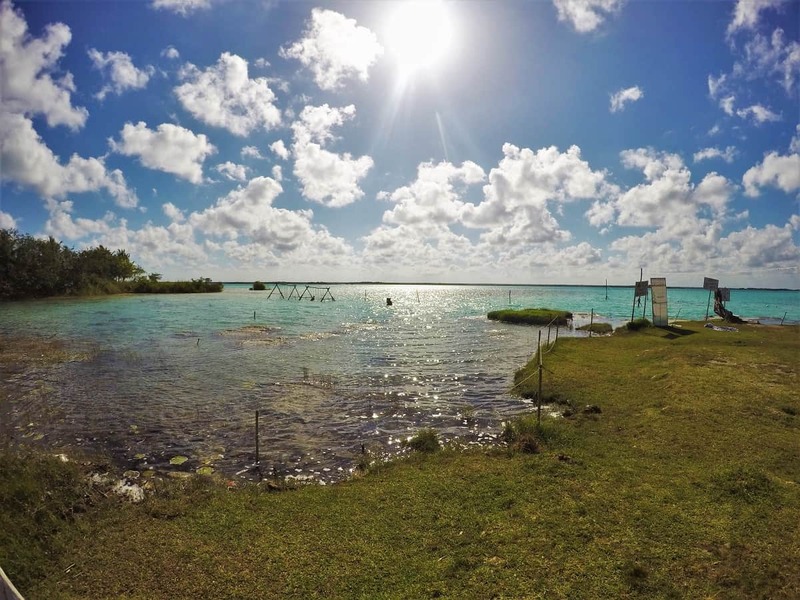 The town sits on the shore of Lake Bacalar, which is a beautiful aquamarine colored freshwater lake. The lake is large, and being the color that it is, it’s hard to believe that its fresh water when you first see it. I mean, a freshwater lake with turquoise colors just as vibrant the Caribbean waters of Belize, yeah, pretty unbelievable. During the month we spent in Belize, our progress in studying the Spanish language sort of took a back seat, so we needed a tranquil spot to get back into the swing of things. We found ourselves a great little campground at the edge of the lake and set up shop. It was a beautiful spot, complete with a swing set built just off shore in waist deep coral blue water, not a bad place to brush up on my Spanish, that’s for sure. At this point in the travels, I would have considered myself to be around 30% with the language, which wasn’t great, but good enough to communicate and get by. It didn’t take long to get back up to speed, so we enjoyed one night camping out at the lake shore, then decided to opt for free camping on the street near the main plaza of the town. Between what we read from other travelers on iOverlander along with our own intuition, we felt safe just parking on the street in Bacalar. There were families out and about playing in the square at night, and you got an overall sense of security throughout the town. It’s certainly not that way everywhere we go, but when we do get that sense of security, we like to take advantage and save a little money. At this point we were still amid our alcohol-free stint, so what better way to spend our time than eating. In that department, Bacalar most certainly did not disappoint. We had what I can safely say was the best vegan cheese burger I have ever tasted at a nice little café called Mango y Chile. Now I am not one to avoid the red meat, but I have to give it to them, it was a damn tasty fake burger. On the breakfast side of things, a cozy little café on the square served up some of the best chilaquiles in Mexico, and this according to Lindsey Daley, the chilaquiles queen. Everything we ate was delicious, but the one that topped them all was this unsuspecting food truck called Banana Go. This place was so good that we ended up staying in Bacalar an extra day just so we could eat it again. Their specialty is rolling up an assortment of ingredients in your choice of either a tender flattened out chicken breast or a succulent filet of white fish, battering it, and then deep frying. 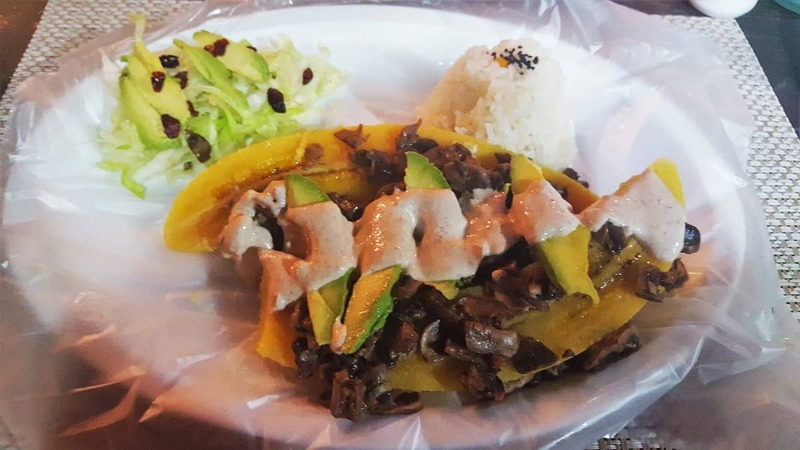 The healthy option, which was also fantastic, was a plantain, but instead of rolling and frying, they boiled it, split it in half, loaded it with the ingredients of your choosing, then topped it with fresh homemade sauces. Lindsey opted for the sautéed mushrooms with avocado and chipotle cream sauce. I opted for the fish filet stuffed with creamy garlic shrimp, langoustines & cheese. It’s one of those things I salivate over whenever I think about it. Do yourself a favor and check this spot out if you ever find yourself in Bacalar. After a few days of adjusting back to the Mexico life and indulging ourselves in Bacalar, we headed north up the coast to Tulum. Many of you may be familiar with this coastal city, as it is one of the more popular Mexican Riviera destinations these days. The bulk of the city sits about a half mile inland and consists of maybe 50 square blocks, most of which are residential. There is a main road filled with bars, clubs, shops, and restaurants where you can spend hours sampling the local cuisine and catching a buzz, but the best part of Tulum is found along the coast. There is a single road running north to south along the beach where you find a slew of resorts, restaurants, bars, beach hangouts, and even Mayan ruins. The resorts range from your high class, fancy hotels, to some of the coolest little beach hideouts you can imagine. Here, you can get yourself a little treehouse or private beach bungalow tucked away among the swaying palm trees, only steps from the turquoise blue waters of the Caribbean. Pretty much the picturesque definition of paradise. For us, we just wanted a nice place to park the truck near the beach, but unfortunately, we showed up in the beginning of March, right at the start of spring break. As we drove up the beach road, we were amazed at how incredibly packed the entire place was. There wasn’t a parking spot to be found, and frankly, spring break had lost its appeal and we wanted nothing to do with the massive crowds of drunk college kids. That being the case, we decided to head a few miles north of the madness to see what we could find. With a little help from iOverlander, we ended up finding ourselves one of the best beach camping locations of our trip thus far. It was only a few miles north of town, located at the end of a long, unmarked dirt road that we would have never found without iOverlander. The road lead to a perfect little cove about a half mile in diameter that had a handful of small boutique hotels along with this great camping spot tucked into the south corner. It seemed to be a popular spot with the locals, and possibly their best kept secret, because we didn’t really see any tourists in the three days we were there. There was a little shack serving up fresh seafood and ceviche during the day, and at night the place was quiet and serene. The cove was protected from the rough waters of the Caribbean by a large reef that ran along its mouth, and as a result created great conditions for snorkeling. There were small reefs within the cove filled with tropical fish, several types of rays, and even a friendly sea turtle that hung out for most of the day. It was also the perfect place to break out my spearfishing gear. Each day I would head out and spend a couple hours hunting and tracking down dinner. For the most part, the fish in the cove were small, but with a little bit of patience I was able to spear us a few snappers. On the menu tonight; Fresh speared cajun snapper over a bed of rice with sautéed vegetables!! It was a tough spot to leave, but we had so much that we still wanted to see in Mexico. After three days of relaxing, we began heading north. We had to get a new tire for Poppins after our flat in Belize, so we stopped in Playa Del Carmen for a day to get that sorted out. Turned out to be more difficult than expected because of the awkward tire size on Poppins. I went to seven places before I found a shop that had the size I needed. Once we got that situation resolved, it was onward to the northern tip of the Yucatan Peninsula to a small island called Holbox (pronounced hole-bosh). 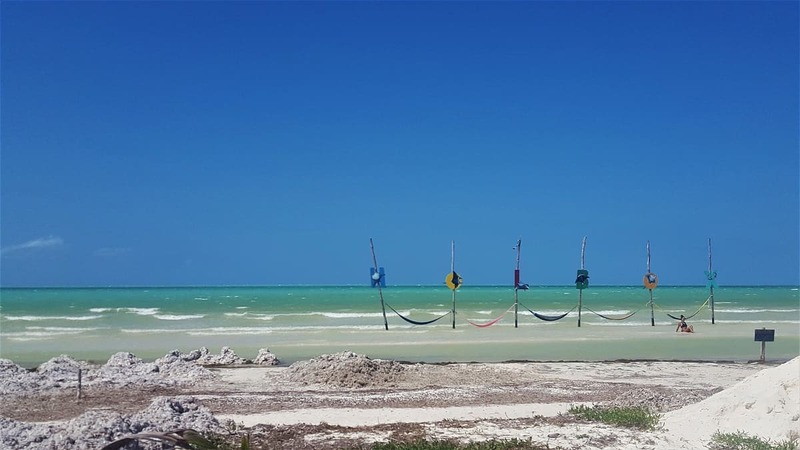 To get to Holbox, you must head to the small town of Chiquilà and hop on a 20-minute ferry ride to the island. There isn’t much to Chiquilà except a few restaurants and shops, beyond that it’s mainly parking lots for storing your car while you visit the island. For accomodation, there are lots of options on Holbox, we opted to rent a studio apartment through AirBnB that had all the comforts we don’t get all that much of. It’s nice to splurge every now and again on this trip, no offense to Poppins or anything. As for the island, it will probably end up being in my top ten favorite places in Mexico. The island itself is a decent size, but the “downtown” area is limited to a few square blocks. Outside of that there are a handful of streets that run east and west where you find most of the nicer beach front hotels and resorts. The resorts on the island are different from your super fancy resorts you might see in Cancun or Playa Del Carmen. In Holbox, they have a much more rustic island feel. Most of them are built up from the sand out of raw logs and bamboo, creating a much more laid-back atmosphere. Don’t get me wrong, those Riviera Maya resorts are great and all, but they create a disconnect from the local culture and feel. I mean, beyond the language, staying at a fancy resort abroad is not all that much different than doing it in let say, Florida. 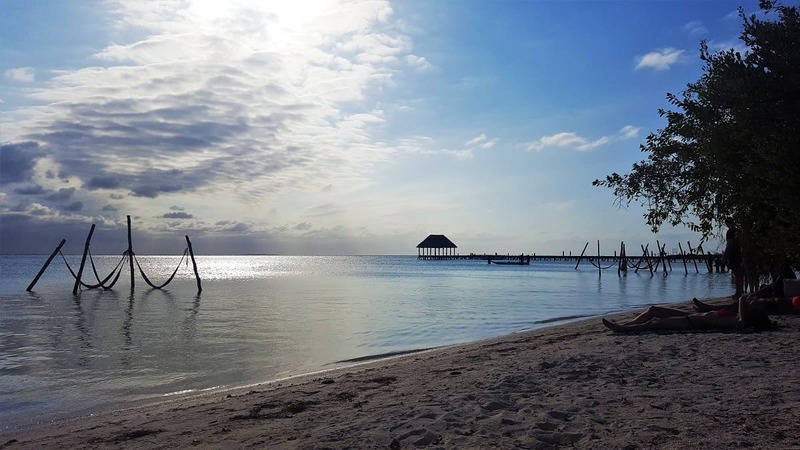 On Holbox you can stay at one of these nicer resorts or hotels and still be neck deep in the local vibe. The downtown area of the island is full of life and energy. There is a small local population, but for the most part it is a traveler’s destination. There are no cars on the island, just golf carts, bikes, and dirt roads. Beyond the small bars and restaurants associated with the hotels and resorts away from town, all the business is pretty much found on 3 or 4 of the main streets. While the area is small, there is certainly no shortage of bars and restaurants. Linds and I were still on the wagon during our visit, so besides peaking our heads into the local unique bars and imagining what it would be like to party there, we mainly spent our time enjoying the small cafes and restaurants. Our favorite by far was called El Chapulim, a cozy little spot that didn’t even have a menu. It was only open nightly for dinner, and when you sat at your table the head chef would come out and tell you about the four different dishes he was cooking that night. We opted to try the fresh local sea bass in a parmesan peppercorn sauce and garlic shrimp with fingerling potatoes, both served with this unique fruit salad made with fresh herbs and crushed red pepper flakes. For desert, they offered up local cheesecake made in the café that was across the street, it did not disappoint. Quite possibly some of the best cheesecake I have tasted, along with one of the best meals of the trip thus far; at the very least, top 5. To counteract our excessive eating (because we tend to eat more when not drinking), we rented bikes for a day and decided to explore the island. We first road to the north-east end of the island where long stretches of white sandy beaches lead to what seemed to be a haven for kiteboarding. 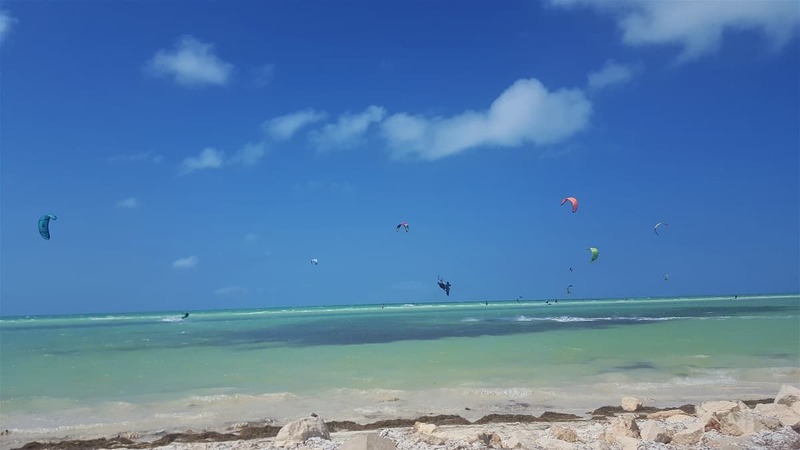 If you aren’t familiar, kiteboarding is a sport where you ride on a board similar to a wakeboard, and you have a large sport kite (almost parachute like) strapped to your waste that you use to lift you from the water and cruise around at high speeds. Seemed like this spot on Holbox attracted professionals, because some of these guys were badass. It’s pretty wild to watch them ripping around at 20+ MPH and sometimes catch air as high as 20’ out of the water! The bike ride from here to the other end of the island took maybe 25-30 minutes. On that side you find a more tranquil scene since the island blocks most of the winds blowing in from the north. If you are looking for calm seas, quite beaches, and hammocks hung in the water, this is your spot. A beautiful place to read a book, or just simple hang out and maybe take a nap. You know you found a special place when you can have such a full spectrum of things to do. Whether it’s eating well, drinking & partying, enjoying the rustic resort life, or hiding away on a quiet beach, Holbox has it all. For those of you with traveling or vacation in mind, put this one on your list. After enjoying a few days of island life with our little studio apartment, it was time to get back to truck life. Our next destination was also on the north coast of the Yucatan peninsula, near a little town called Las Coloradas. Las Coloradas is located on a sliver of land that runs for about 40 miles from the town of El Cuyo all the way to the town of Rio Lagartos. We didn’t actually stay in the town, or do anything there for that matter, but it was the closest point of reference as to where we were. 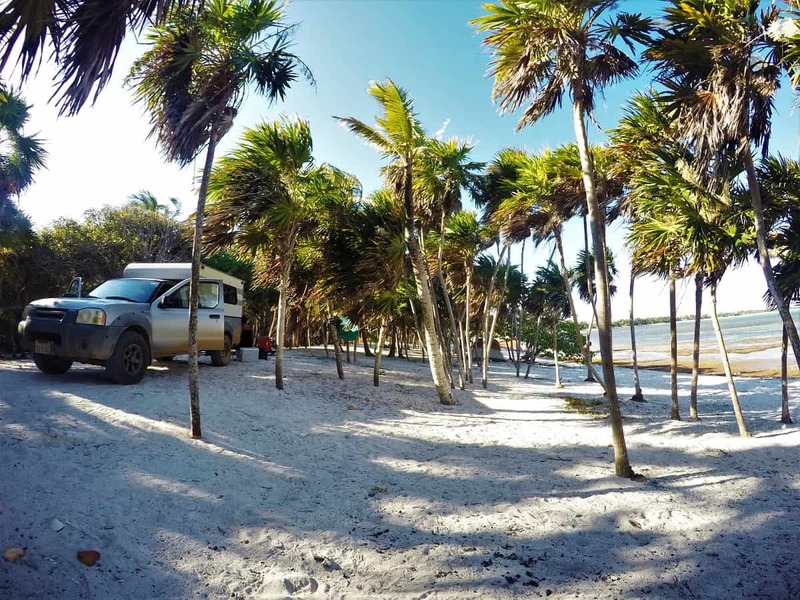 On this baron strip of land, we found ourselves extremely secluded boondock camping alongside miles of undisturbed white sand beaches and turquoise water. Aside from that, which was really just an added bonus, the area has two main attractions. The first being the wild flamingos that call the large lagoons home during the spring and summer months. The second, and possibly more widely known, is the vibrant pink lagoon, made famous in recent years through Instagram and other social media outlets. We found ourselves arriving here at an interesting time since the flamingos were just beginning to migrate from their winter home. For the months beginning in November up until late March/early April, tens of thousands of these strange yet majestic birds are found in another lagoon on the west coast of the Yucatan peninsula near the town of Celestùn. During March/April, they migrate to the lagoons surrounding Las Coloradas where they stay and rear their young until following November. We were there in mid-March, so only a handful of flocks had made the migration, but it was still a treat waking up to wild flamingos strutting around. Fun fact, the reason flamingos are pink is due to their diet. They feed in shallow waters, stirring up the pink and red algae that forms on the bottom with their long awkward legs. When you see a flock of these birds, you will notice that some are a darker shade of pink than others, some almost red. This happens when the birds have a healthier diet of this algae. The birds you see that are a pale shade of pink, sometimes almost with a grey hue are malnourished. Knowing that, it makes sense why you find them calling this place home, considering it is nestled along the banks of the pink lagoon. 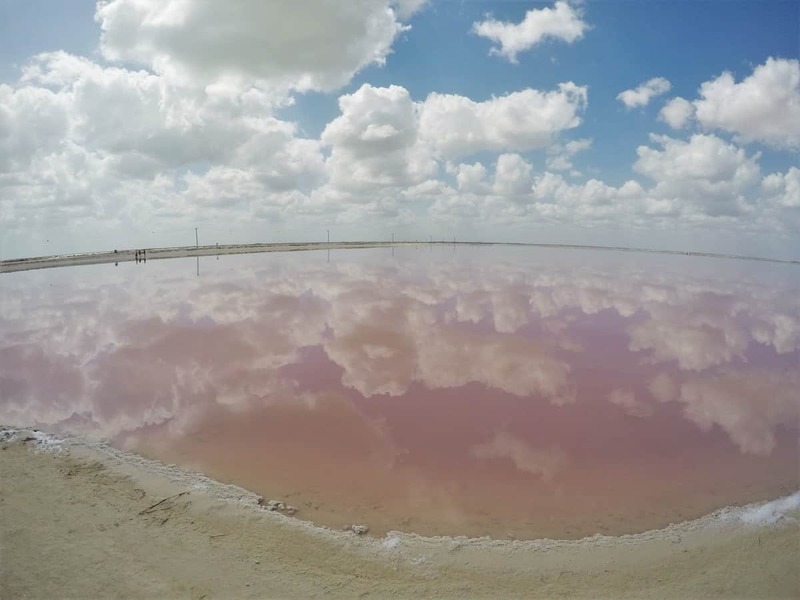 The entire area consists of a series of large lagoons, some with only a minor pink hue, others more brown, but there is one closer to the town of Las Coloradas that is vibrant pink, like nothing you’ve ever seen. It’s in the middle of these large salt flats where they apparently export a large majority of the salt we consume in North America. It’s in these flats where the pink algae thrive turning the water into a sea of pink. 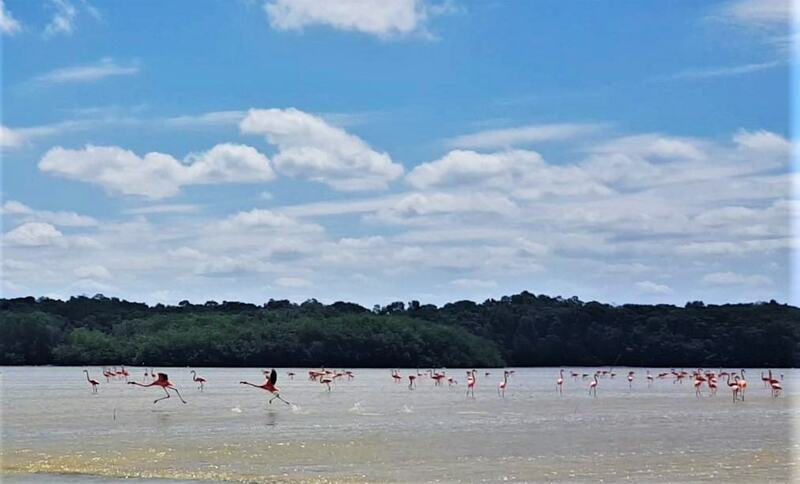 Now that we had gotten our beaks wet and saw a handful of wild flamingos (pause to chuckle at the pun…), we couldn’t resist making the journey to Celestùn so we could see the funky birds by the thousands. We could only hope that the rest of them didn’t make the migration while we were making the trip across the Yucatan to see them. On our way across, we spent a couple days in the middle of the peninsula visiting some Mayan ruins, underground cenotes, and Yucatan’s’ capital city of Merida. 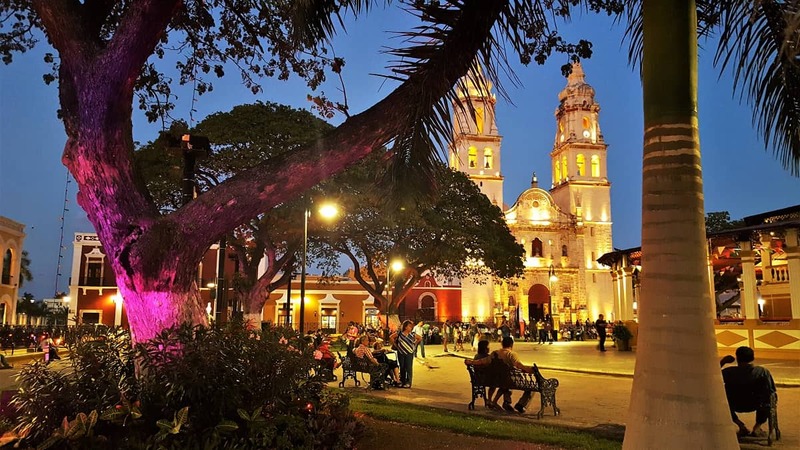 Merida was an interesting town, sort of split between a modern city with new modern restaurants and chain stores, but also an old neighborhood with where the local Yucatan heritage was alive and well. While I wouldn’t put Merida on my list of favorite places in Mexico, we did go to the old neighborhood and enjoyed an amazing meal sampling some local Yucatan cuisine. To my surprise, many of the dishes we sampled were similar to Indian dishes using lots of exotic spices and strong flavors, but instead of soaking it up with garlic nan, you were given fresh handmade corn tortillas! Celestùn ended up being a pleasant few days for us. We found a great spot to camp using iOverlander that was right on the beach, but fenced in and secure. It was a huge space with a handful of palapas, probably big enough for 10 or more large rigs, and we had it all to ourselves. Well, ourselves, the peacocks, and the three horses that lived on site. In the morning the owner would release the horses from their pen and let them roam free for the day. When I say free, I don’t mean within the fenced area of the campground, I mean free. They would literally roam around the beach and the marshlands that surrounded the town, where ever they wanted to go, but would come running back like clockwork each evening when the feeding troughs got filled. For the low price of five dollars, Linds and I took them out for a nice little ride on the beach for sunset one evening. I will admit, it’s been years since I was on a horse and it took a little getting used to at first. It’s all about establishing control and dominance, but easier said than done on these massive animals that could buck you off at any moment. 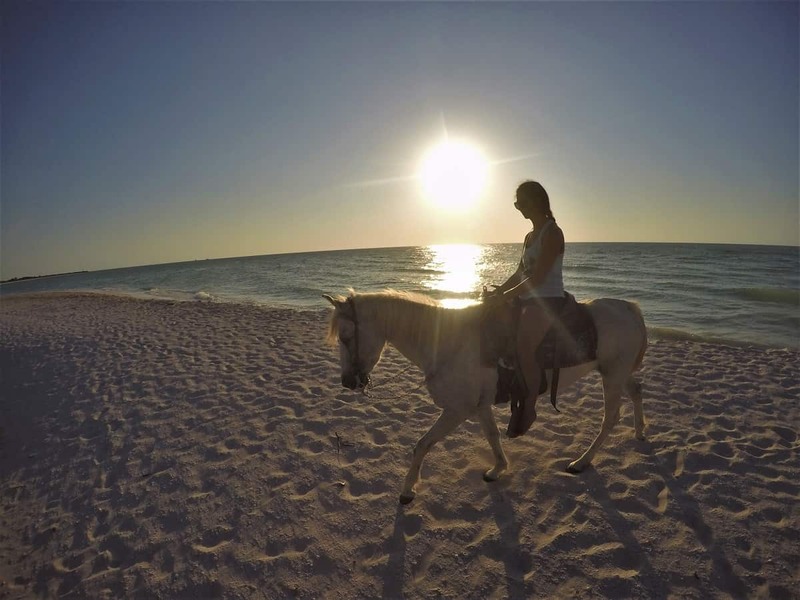 Once we got settled in and comfortable, we had a blast galloping down the beach as the sun set over the Gulf of Mexico. 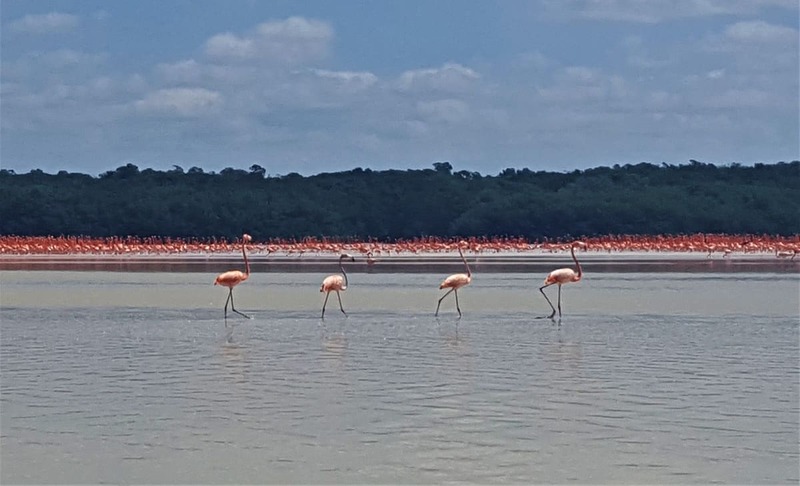 We spent one of our other days doing some of the more touristy activities and got onto a tour boat that took us around the lagoons to get up close and personal with the flamingos. There really wasn’t a place to get close to the birds without a boat, so as it turned out it was worth it to take the tour. Sometimes tours are a waste of money because you can easily do these things on your own, but this time it was money well spent. Luckily, the birds hadn’t migrated over to Las Coloradas yet, and we got a chance to see them by the thousands. Such a unique animal, my favorite is watching them take off. They get a running start on the surface of the water with their long lanky legs while their gigantic wingspan furiously works to lift them into flight. Very cool. After Celestùn and our final cenote stop (which I discuss in my other Yucatan blog post), our plan was to do a long haul across Mexico back to the west coast and the state of Oaxaca. We ended up making a stop in the gulf coast town of Campeche first, which turned out to be a nice visit. Specifically, the old town area of Campeche features cool architecture and vibrant colorful buildings on narrow streets. The main plaza was clean and full of life. We only spent one evening enjoying the town, but it seemed like a lovely place to spend a few days. We had our hearts set on getting back to the pacific coast though, so it was a shortstop. We had been looking forward to the state of Oaxaca for months, and we were finally on our way!